There are no coincidences in life, everything happens for a reason—every action from the past affects the future. When the stars are aligned and the magic is right, it causes sparks and results in something great. Thus, after accidentally meeting the Director of New York Film Academy, Dan Mackler, at a Russian TV-channel, the writer, producer and director, Costa Fam, began a new stage of his career. Despite the desire to continue an education at NYFA, Costa Fam, due to family and business, couldn’t leave everything and move to America. By a happy coincidence, the New York Film Academy was holding a 13-Week Producing Workshop in Moscow, taught by Lydia Cedrone, Paul Brown and Gilbert Shilton. During this course, Fam began working on a global historical project called Witnesses. He was nurturing this idea since his visit to the Auschwitz Memorial and Museum where he was struck by a display of thousands of shoes of the concentration camps’ victims. A trilogy, Witnesses, is the first feature film from the former Soviet Union produced in memoriam of the Holocaust victims. Each part of the project provides a whole new unique way to look at the greatest catastrophe of the 20th century. «Shoes», film tizer. from General & C on Vimeo. 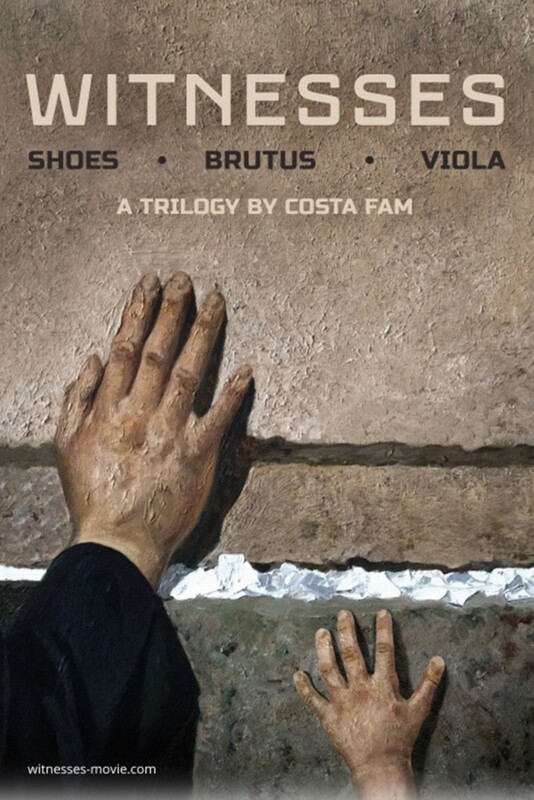 Shoes (2012) is the opening short of the trilogy. It shows the story from the point of view of a pair of red shoes, which begins in a shop window and tragically ends in a mass grave at the Auschwitz concentration camp. The film was also an official contender for Best Short Film at the 2013 Academy Awards. This is the first film to be granted permission from “Auschwitz-Birkenau” to shoot on the museum territory, making this exception for the art project. Also, this short was added to the movie collection of Yad Vashem (Israel), along with outstanding films about the Holocaust by Spielberg, Polanski, and Benigni. The second part of a trilogy, Brutus, starring Oksana Fandera and Filipp Yankovskiy, tells the story of the Holocaust through the eyes of a German Shepherd named Brutus, who is separated from his beloved mistress. After being separated, he becomes a watchdog at a concentration camp. Brutus is trained and psychologically manipulated at the camp, which turns him from a harmless pet into a vicious killer. The film is based on the eponymous story written by famous Czech writer Ludvik Askenazy. Brutus is currently in post-production and is scheduled to premiere in the summer of 2016. The world of the third short in the trilogy, Violin, based on a short story, revolves entirely around the unique instrument that has passed through all the horrors of the war. The story begins in a violin shop in Nuremberg, where at the beginning of the 20th century the violin was created as a gift to a Jewish boy. The instrument changed many owners and appeared in various places. Its story ends a hundred years after its creation with a concert at the Wailing Wall of Jerusalem. Costa Fam shared with NYFA that the lead character in the third and final part of the trilogy will be played by German actor Lenn Kudrjawizki (The Counterfeiters, Enemy at the Gates, The Transporter Refueled). Lenn Kudrjawizki is a real treasure for Costa Fam. In addition to his amazing acting career, Lenn is a wonderful violinist who graduated from music conservatory. Actors from previous parts of the trilogy will be involved as well, including Oksana Fandera, Vladimir Koshevoy and Mariya Zykova. Shooting will take place in Russia, Israel, Czech Republic, Poland and Belarus. Costa, you have six children, how do you manage to achieve a balance between work and family? On the one hand, it is impossible to achieve balance. On the other hand, I am absolutely happy in what I’m doing and I share this happiness with my children. In the end, it’s not the amount of time spent together that affects relationships, but the quality. When I’m with my children, I try to find time for everyone. Often times, I try to be a friend rather than a parent. Also, each of my kids knows that he/she is “my favorite child” and that they can count on me to support them. I think that is the most important feeling for a child to feel about his dad. What childhood dreams have you managed to bring to life? Most of them: I do what I love. I also really wanted to travel – just in the last year I crossed the ocean over ten times. More interesting is what dreams I failed to realize. When I was a child I naively dreamed that all people on Earth can love one another, and there will be peace throughout the world. Now I understand that this is an impossible dream, but I can take small steps towards it and, by doing my job, build a ladder to the sky. If you can call the past, what advice would you give your 20 year-old self? I can’t say that I regret anything in my life and would like to fix it, but one piece of advice I would give is to learn languages. Particularly English, in my case. What advice would you give to our students, aspiring filmmakers? Shoot, shoot and shoot! Unfortunately, in the filmmaking business we can’t practice and rehearse like we could in sports and music. Fortunately, now you have an opportunity to shoot on camera or your phone and see the results instantly. Here is some practical advice: choose the scenes from your favorite films, invite aspiring actors (who also need training) and make your own remakes of those scenes. The results will surprise you a lot!